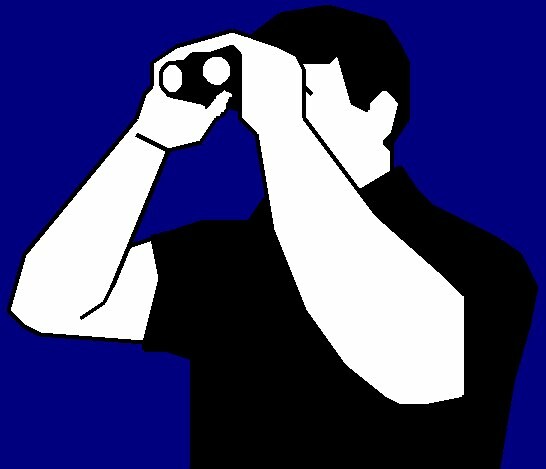 How did you get into birding? Did you or do you have a birding mentor and can you tell us about that person? I started out in college in a pre-veterinary program. I was in interested in doing zoo medicine and started hanging out folks in wildlife biology. 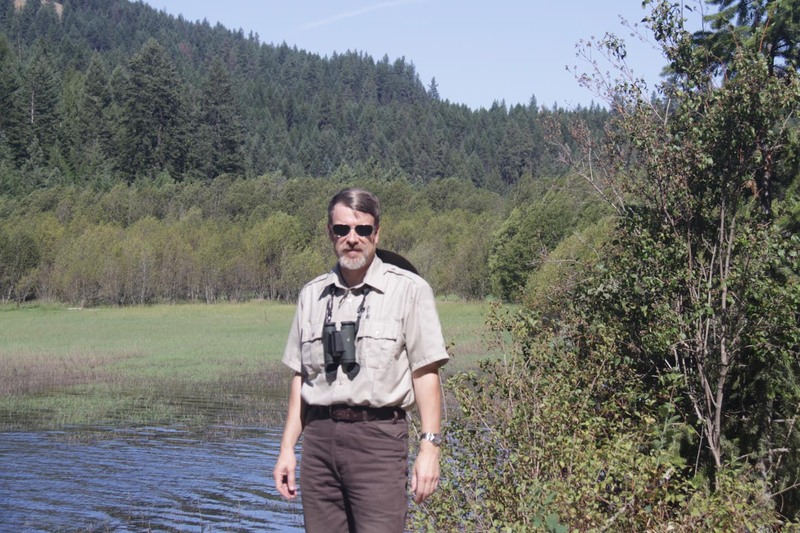 I started working with a professor who was not only an excellent ornithologist but an avocational birder. Next thing I knew I was studying Great Gray Owls and chasing birds all around SW Idaho. Then the change to wildlife biology. That professor Leon Powers certainly has taught me a lot about both the technical science but also about the joy of recreational wildlife watching especially birding. He is still a good friend. I started regular birding with Leon in 1986 so it has been 25 years this fall. How often do you go birding? And where do you regularly go birding? Where is your favorite place to bird in Washington? In the U.S.? in the world? Since I work in a National Wildlife Refuge I get to do a little birding every day even if just from the office window. It looks out over the riparian zone of the Little Pend Oreille River. If I am in the field I always have binoculars and am looking around even if birds are not the primary purpose. Favorite place in Washington would have to be the Little Pend Oreille National Wildlife Refuge. I am a bit biased on that. As for a place that does not pay me to be there it would have to be Olympic National Park. It has everything from alpine species to Spotted Owls in the forest to near shore pelagics in the coast strip. In the US Craters of the Moon National Monument and Preserve is still a favorite. But I may a bit biased on that one too as I worked there for 13 years. The Chiricahuas in SE Arizona, Redwood National Parks on the coast, the Yukon stretch of the Alaska Highway and my favorite areas. Yes I know the Yukon is in Canada but it is on the way to Alaska. In the world it is a toss up between Tasmania or Iceland. Most exotic place you have gone birding? Mount Field and Tasman National Parks in Tasmania were simply incredible. Þingvellir National Park (pronunciation: thingvellir). Being islands neither Tasmania nor Iceland have particularly large number of species but they both make up the lack of numbers by the high rate of endemics you are not going to find anywhere else. How would you describe yourself as a birder? A “watcher”, a “lister”, a “chaser”, “ticker”, “twitcher”, an “ornithologist”, all of the above, or something else? All of the above. I am a professional biologist trained in ornithology. I do maintain lists and have been known to do some chasing for life birds. SE Idaho was good for that given the relatively high rate of vagrants. On the other hand I do enjoy and spending a lot of time just watching. It must be the scientist in me but I spend a lot of time just watching bird behavior. Vortex binoculars and Bushnell spotting scope, Swarovski binoculars, or Leica Spotting Scope. It depends on where I am (access to different equipment at work). I use a software package called Birder's Diary. For me it is far away the best commercial product out there. The reason I prefer this one is it can use almost any type of taxonomic list out there. I currently use it to record observations of birds, mammals, amphibians, reptiles, butterflies, dragonflies, trees, cacti, mushrooms, trees, wildflowers, and fish. Yes I have a life list of wild cactus. Only one, I'm not sure I can narrow it down. My first Great Gray Owl, my first Spotted Owl, Wonga Pigeon (lifer # 500) all come to mind. I think I will go with my first drake Harlequin Duck. I was in college and we were on field trip to the Oregon coast. First the camaraderie of the class, then the amazing color of the bird that was when I was hooked. What is your favorite yard bird? Any good backyard birding stories or amazing yard bird sightings you can share? When I lived in Arco, Idaho back during the great Blue Jay invasion fall of 2008, I heard jays screaming near my bird feeder. I was in the side yard and went around the corner just in time to see a young Northern Goshawk take one of the jays. He quickly flew up into one of spruce trees and started eating. It was not my backyard, but I had a chance to visit relatives in Sweden last spring. They had both Mew Gulls and Eurasian Oystercatchers nesting on the roof of the seaside apartment building. Not your typical backyard birds but pretty nice. Too many to list. IBLE, The Bird Guide websites. David Sibley's website is fantastic for ID information. Cornell Laboratory of Ornithology's website is impressive. BirdWatching is a great little magazine and is a great resource. On the more technical side journals like the Journal of Field Ornithology, Western Birds, Northwestern Naturalist are some of my favorites. "Birding is Fun!" - I actually have this site as my home page on my desktop. (Major brownie points for saying that!) A relatively unknown I have been using a bit lately that I am really impressed with is the USFWS Feather Atlas. It has tools to ID a single flight feather in many cases. The Sibley Guide to Birds is the one I carry. David's paintings are amazing and is one of the most well researched. For a digital guide, I use Thayer’s Birds of North America. It’s great software package. It has a quiz feature and the song features are great. When I need to practice or study for survey work this is what I use. Field Guide to the Nests, Eggs and Nestlings of North America (Harrison) This is a great book for a side of bird ID that is often overlooked. The Flight Identification of North American Migrant Raptors (Sutton, Dunne, and Sibley) Great little book on identifying hawks as we actually see them most of the time. I have dabbled in a number of things but much of my experience is with owls and coniferous forest passerines and woodpeckers. Continue exploring my new location here in NE Washington. I just moved here about 4 months ago. What is your current nemesis bird? Boreal Owl. I have spent years surveying forest owls. I have gone to known active breeding territories, I have accompanied Forest Service staff on survey to known sites. If I'm there it will be the only night all season they won't get them. Birders who do not follow the rules or even break the law. Trespassing is a big one. A significant birding site here was recently closed to the public because people kept driving into an area which was posted no vehicles. So now the land owner no longer allows any entry, because a few people would not walk a couple of hundred feet. I have seen Great Gray Owls abandon nests because hundreds of birders came to see it and numerous people refused to stay on the trail and got too close. I have never been married so don’t have kids. However, I do have the world’s smartest nephew (although it may be possible I am a bit biased on that one). Photography and travel are the big ones. Any funny or embarrassing birding experiences you could tell us? A couple of years ago while doing the CBC in Howe, Idaho I was riding with a certain birder from another city to the east of there. Some unidentified songbirds flew across the snow covered BLM road in front of us. The driver slammed on the brakes. After we identified the American Tree Sparrows we all jumped back in his truck. Only to find out we could not move. Back outside to spend about 20 minutes digging to get moving again. Fortunately he had a shovel in the back of his truck. After we spent some time digging the driver asked the rest of us is there a door open on your side. No we answered. Because his keys were still hanging in the ignition switch and all the doors were locked. We were a long ways from any town so we found out the shovel could be used for breaking windows as well as digging. For some reason 2 of the 4 guys in the truck have never done that CBC again. The story you have just read is true. The names have been changed (deleted) to protect the guilty. Great Gray Owl. After 24 years they are still fascinating. Never get so serious that it is no longer fun. I am the only person I know who has been bitten by Great Gray, Spotted Owls, and Merlins. For those of you who are wondering how that happened. I have had the privilege of radio tracking all 3 of these species and for some reason none of them like to be handled for attaching radio transmitters. You are keeping control of the talons and wings while trying to get a backpack harness for the transmitter around the wings and sometimes you loose track of the beak. Fortunately none of these bite very hard. It is the feet you have to worry about. Very interesting interview with Mike!! Thank you for sharing with us.